A digital camera is practically a necessity. Take many pictures from different angles as you disassemble the device. This creates a record that can help when you forget which way round this little clip goes, or where on the circuit board the blue and orange wires were soldered. Keep track of the little bits. I use soap dishes, old plastic dinner plates, and little baggies (of the sort you get from Digi-Key) to hold screws, clips and small parts to keep them from disappearing. Some parts like knobs, buttons, keypads and so forth will need to be scrubbed along with the bigger parts, so keep these separate, and take measures not to let the really small bits go down any lavatory drains. For me this usually means placing a coarse rag over the drain when rinsing cleaned parts. There are no magic products that will work for every type of grime and stain. But I find that cleaning products you commonly find around the house will be sufficient in all but the most extreme cases. Just soap, water, a rag, an old toothbrush and some effort will usually produce dramatic results. Here is a table of some products that I have found useful, along with example brands available in my location. Exercise caution for products in the yellow area, the others are fairly safe. Dunking plastic parts in soapy water is a fairly benign thing to do. I can only recall two times that soap & water contributed to unintended damage. 1) The markings on a Tektronix oscilloscope vertical attenuator knob came off as if they were decals. 2) The ink came off a bar-code/serial number label on a Fluke DMM. Both situations were unique in that I have immersed other knobs and other labels many times without negative consequences. Allow time for thorough drying. Shaking/tapping the parts and blotting with paper towels will speed things up considerably. Place the items in front of a fan for at least an hour or so. Forced-air bathroom heaters on low setting work well, just beware of excessive heat that might melt or soften plastic. 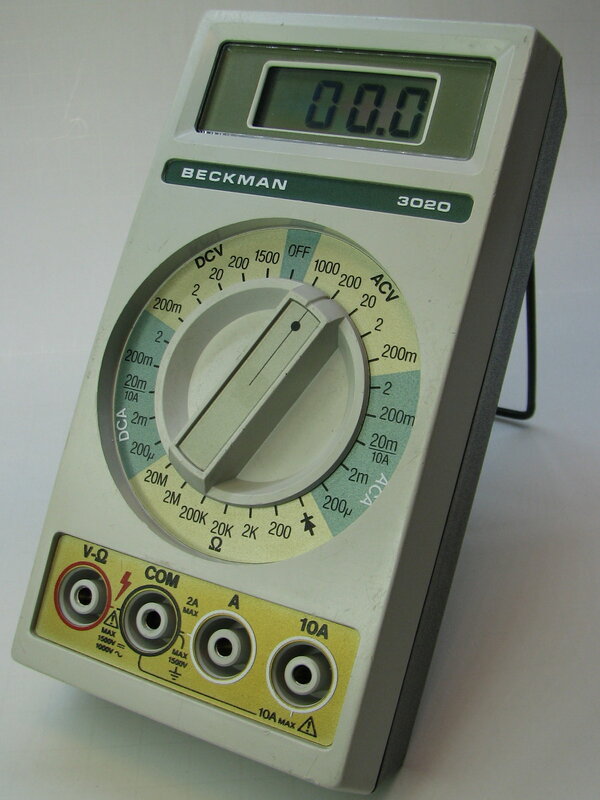 Two special items to note with regard to multimeters, test leads and piezo elements. Don’t forget to dunk the test leads into the soap and water when cleaning the rest of the unit. Use a rag to clean the handles, wires, and plugs. Remember the black one is just as dirty as the red one, although you can’t see it. When finished, shake or tap the water out of the shrouded plugs and hang up to dry. Piezo buzzer elements are often permanently affixed to the back cover of some designs. Brief contact with water does not damage piezo elements at all. Just be careful not to physically damage the element by striking it with something hard like a metal tool, toothbrush handle, etc. Note that during the drying-out process water will usually collect behind the piezo element and may need a shot of compressed air to aid drying. The clear plastic lens cover over LCDs can be quite a challenge. Some multimeter users apparently just throw their unit right into the toolbox with the screwdrivers, wrenches and utility knives. You have to accept that lenses damaged in this way are unlikely to ever look new again. But the appearance and clarity can usually be improved with a few applications of plastic polish. I am not an expert at this, but I get decent results by using products from the auto parts store intended for modern headlight lenses, like PlastX. Just apply the polish and rub vigorously with a soft cloth. It’s a good idea to do this before cleaning the rest of the case, so that the polish residue can be removed with water. For really tough cases, I have used abrasive powder cleansers like Bar Keeper’s Friend or even very fine grit sandpaper to smooth out bad scratches and solvent damage. (Mix a few drops of water with the cleanser to form a paste.) This will severely haze the lens, so be prepared to spend a lot of time with the plastic polish to restore clarity. This process will probably leave a lot of light scratches in the lens, but in some cases this is much preferable to the original appearance. Most of the time, polishing by hand is sufficient, albeit tiring. On occasion I have used a rotary tool (Proxxon IB/E) with a polishing wheel, at it’s lowest speed. But you have to be very careful doing this, because using a high speed tool can create enough heat by friction to melt or soften plastic. And if the metal spindle pokes through the polishing wheel, it can make yet more scratches. Yikes. This gallery illustrates the clean-up of a Fluke 189. The condition wasn’t too bad, but the Fluke signature yellow over-mold was discolored and grimy, and the probes were very dirty. This entry was posted in How-To and tagged DMM, Vintage. Bookmark the permalink. The fluke cleaned up smashing and i dare bet you feel it works better as well. Metholated spirits seems ok for pcb’s but never use on clear plastic items. Some chemists/drug stores just dont like selling isopropic alcahol, perhaps its only the u.k ones that are a bit over carefull. I think what you call methylated spirits is what I call denatured alcohol. I read somewhere that whatever is added to de-nature the ethanol (ie. make it poisonous) varies, so I try not to use it for PCB cleaning just in case it might leave a residue. Still a good general-purpose solvent though. Isopropyl alcohol is easy to find in drug stores in the U.S. 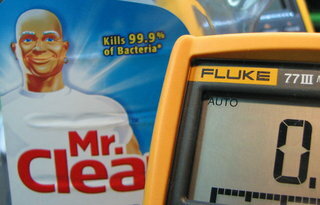 The 70% “rubbing alcohol” variety is common as dirt, but 91% is also widely available and is suitable for my purposes. Thanks for this information, you have listed some products I will have to look into that I never knew existed. The lens cleaning / repair options are really helpful. I personally have never torn a meter down and washed it, I just clean the outside of the meter. I have bought several Fluke meters in the past that looked to have been used in the automotive field due to the grease and grim on them. I have found the worse they look the better price I can buy them for so I like them dirty. I use the white cream hand cleaner to clean the out side of grease and grime. For sticker residue my go to cleaner is WD-40. I have never used products made specifically for removing sticker residue so I do not know how it compares. One time I was cleaning a 77IV and after using the hand cleaner I wiped it down with 91% iso alcohol. Shortly after posting the pictures of it on a forum, it was pointed out that the yellow stencil marking for the secondary functions were missing. I am not 100% sure but I think the alcohol was the culprit. Whatever the cause, I am now extremely cautious when cleaning around the markings. I thought I should share this as it may prevent others from making the same mistake. I thought I was the only one allowed to buy dirty meters on eBay. 🙂 Thanks for adding your experiences. Yes, good idea to be cautious about the markings, that’s why I like to tear it down and depend on soap and water as much as possible. Even though I use IPA liberally on the circuit board and contact surfaces, I find it can be a little risky when used on the outside. Testing a small area is probably a good idea before using anything you’re not sure of. Actually I have not had much luck getting meters off of Ebay, most of the ones I have bought come from pawn shops in my area. I think they price them by how clean they are not by the model number, which is good for me. You are correct in testing a small area is a good idea but I did not give any thought when I went to clean the 77IV. Since that incident, I take extreme care around the markings. Bought lessons tend to be the ones you remember most. I like to start my cleanings right after disassembly by putting nearly everything in a water bowl and add some Corega Tabs. These are effervescent tablets to clean artificial teeth. They come in big packs, cost next to nothing and I found them very useful for dissolving even sticky grime and dirt. Next comes a scraping with the toothbrush. In 95 % of the time, this is enough for the item to look like new. Great tip, thanks for sharing! I can’t wait to try it out. Great tips. I remember using Fast Orange in my first job out of high school. That stuff is amazing and smells wonderful also! Thanks for the info, it will certainly come in handy. I discovered a good (and cheap) product by accident. For years I’ve been washing the plastic and rubber case parts of fluke meters in the dishwasher. I strip the meter, remover the piezo buzzer if it has one, and put all the plastic parts in the DW on a low heat cycle with no drying. The other day I put the parts from two 83s in the DW ready to go but forgot about them and the wife came along and filled up with dirty pans and ran the thing on a very hot cycle! The yellow bumpers came out fine as usual but the grey case parts came out with a lot of light grey fading that wouldn’t come off. It looked as if the plastic had been out in the sun for years! A few comments on removing sharpie from the yellow holsters. I know many of us have an issue with it. As a chemist I have access to quite a few solvents so I did a test on a heavily abused Fluke here at work. Reagent grade Methanol: Fades the sharpie, no transfer of yellow from the holster to the cloth. 1-butanol: performance similar to methanol, offensive odor, gives me a slight headache. Pure Acetone: 100% removal of sharpie but heavy transfer of yellow from the holster to the cloth. Appears to actually degrade the holster a bit. If you have a textured case it will make the case shiny by removing the texturing. DMSO: 95-99% removal of the sharpie, seems to attack the holster significantly less, especially initially. Upon sustained buffing the rubber turns crumbly, which stops after the DMSO has FULLY evaporated. DMF: Fades it a bit but also smears the sharpie into the rubber. Avoid. Acetonitrile: Fades sharpie, minor yellow transfer. Similar to methanol. If it was me, I would try a short burst of DMSO followed by a 100% Acetone cleaning. You could also skip straight to acetone cleaning. Lastly, followed by a wipe down with MeOH to remove any solvent residues. Note that I tried nail polish remover with less than optimal results. It must be pure acetone, which is cheap to kit on Amazon but it might get you put on a watch list since it can be used to make acetone peroxide. But, I’m not sure what ethers would do to the case rubber. I’ve also had VERY good luck removing sharpie (as well as many other things) with petroleum distillates in the form of lighter fluid. Quick application to plastics and rubbers shouldn’t cause much if any damage… but I don’t have anything good to test with. At least according to the MSDS, zippo fluid is 70% Pentane/Heptane/Octane/Nonane, and 30% Naphtha (http://www.co.vermilion.il.us/MSDS/EMA/Zippo%20Lighter%20Fluid-USA.pdf). Guessing the solvent working on the sharpie is probably Naphtha, but I’m pretty confident Naphtha would damage plastics/rubber. But then, it probably depends on the vintage of the multimeter and what the case plastic is, as well as the holster. Pretty sure silicone cases should be pretty resilient against most things. Curious about cleaning a 8060a. I’ve done the case with Mr. Clean, and a brush, and am pretty happy (though getting the area between the case, and the plastic that’s covering the shielding on the back case is going to take a while to dry). What I’m curious about is cleaning the PCB. All the switches are obviously attached, as well as the plastic around the fuse holder. Should it be safe to just dunk the whole thing? Should I pull the MAC chip? Also, do you let them soak at all, or just dunk, pull, scrub with a toothbrush/acid brush, dunk again, repeat? Or do you just leave the whole thing immersed while scrubbing? I’d assume you’re careful around the trim pots/caps so as to not screw up the calibration? I ended up just swishing it around in IPA (just enough to cover the PCB, but not up to the switches) and then blowing off the excess with compressed air. The back of the board I took a toothbrush and IPA to. So, any tips for cleaning the input jacks (inside)? I just used some IPA on a cotton swab (had to remove some of the cotton to get it to fit), and twisted it around, but I’m curious if you have any other tips… maybe some brasso or something SLIGHTLY abrasive to clean up the gunk? Almost wonder if someone should design a hone for input jacks… because the ones on my Fluke 8060a seem like they’re JUST shy of 4mm diameter (inserting/removing leads seems a bit too difficult). Thoughts? Hi, I would sugest a pipe cleaner would work, and you use what ever you want on it, not like a cotton wool bud. i have a 1981 fluke 8060a. the display is dropping lcd segments. i have had this since new. i believe repair may be beyond me. one key missing cover. any suggestions on finding help? love your site! If the LCD is otherwise undamaged, the missing segments might be restored by cleaning the elastomeric connectors between the small microprocessor PCB and the LCD. Finding an economical repair service will probably be difficult. There are plenty of folks like me who still like to fix old stuff though. You might find someone in a local ham radio club? Thank you for all the great posts and guidance on meter repair. If you don’t mind, I have a questions about replacement parts. I lost one of the selector knob metal contacts on my 189 any ideas on a source for these. I tried Fluke Service but they said it was not a user replaceable part. Yeah, I checked the list of user-replaceable parts for the 189, and it is very short. Battery covers and such. I have no secret source of parts (I should put that in big letters on the front page of this site.) My usual source for older models is to patiently look for a dirty broken clunker on eBay to raid for parts, but that won’t work with a premium model like the 189. Even a broken one would be expensive. Me, I’d be looking through my collection of scrap material. Some tedious work with a Dremel and an old sharpened screwdriver might yield a workable substitute out of a piece of thin springy metal. Since you’ve had this meter apart before, can you tell me how many contacts should be present on the rotary selector switch? I have a feeling one I’m working on may be missing one. I assume you’re speaking of the Fluke 189. I added a picture of the rotary switch (F189_025a) to the Fluke 189 gallery. There are four contact pieces. I am a big fan of Oxalic Acid for cleaning rust from steel parts- it is available in powder form in Australia as a ‘rust and stain’ cleaner by a company called ‘Diggers’. Today I was faced with some very corroded battery contacts from a Fluke meter- they were very green with verdigris and I didn’t hold much hope. In desperation I dropped them in a pot of saturated solution of Oxalic Acid: a few hours later they looked like new. The plating did not seem to have been touched. Unfortunately I didn’t take any ‘before’ photos. Thanks for that information, I’m not familiar with the name oxalic acid. But I just noted that one of the products I use for it’s abrasive properties, “Barkeeper’s Friend”, contains oxalic acid, so I’ll give it a try next time I see corroded battery contacts. In your Fluke 189 clean-up, how did you push the rotary knob out of the switch hub assembly? Thanks so much for sharing these clean-up/repair information with us. To be honest, I don’t remember exactly. From the looks of it I would probably use a small nutdriver to push the shaft out. For all the Fluke models that have this knob and attached shaft arrangement (80, 170, and 180 series), they are just press-fitted in, so it’s a matter of getting some steady even pressure on it until it pops out. 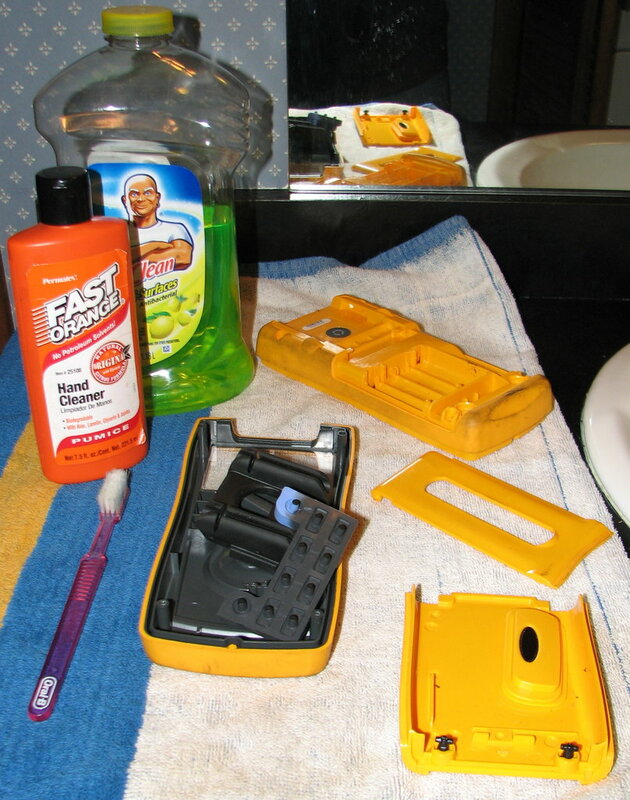 For cleaning the case I use Krud Kutter for water soluble grunge and WD-40 for hydrocarbon grunge. Lacquer Thinner works well for harder stains. For cleaning the PC board I use Strike-Hold (http://www.strike-hold.com/) which is a dry lubricant that has dielectric properties and cleans light rust. If you have a battery that upchucks vinegar is a miracle worker. I have enjoyed all of the comments and will be trying the other suggestions. 20-something years ago from a now-defunct home-improvement store (Hechinger’s). 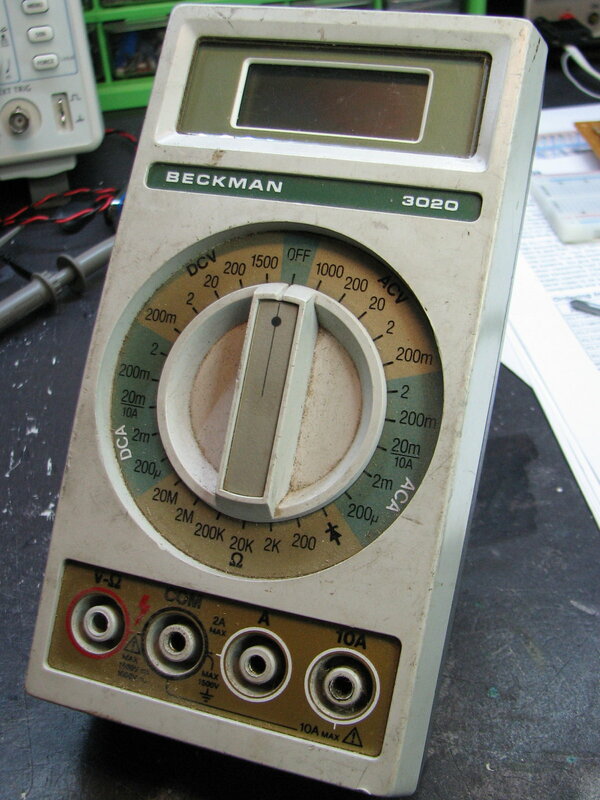 Any positive or negative comments about a little conductive grease between the test leads and multimeter? Haven’t tried this yet but thinking it will let them spin a little easier. Also I read something above about removing Sharpie, the alcohol in hand sanitizer works well for me. If you’re referring to putting lubricant in the jacks, that sounds like a bad idea. Grease attracts dust and dirt. Anything even slightly conductive in the jacks can migrate to the PCB and cause current leakage paths that affect functionality, and also may set off lead alarms if that feature is present. I have just repaired a very dirty 8020B. Cleaned up well with soap and water, Label remover and IPA. The V430A input protection Varistors had failed. I replaced them with RS Components part 239-387 Manufacturers Part V430MA7B. Open input Conductance now 00.0nS DC and Resistance calibration good, not checked AC yet.